"The bright blue colour stands for the progressive spirit of Yonsei community members and the green symbolises the frontier spirit of the Yonsei University Library. The mixture of these two colours creates the official Yonsei Blue, representing the mutual growth of Yonsei Community members and the Library"
As a result of recent University approval to build a new library at Birmingham, Architects have been appointed to start the development and design process. My division, Learning Spaces are on the Design Team with our Librarians so that we can have direct and timely input into the discussions right from the start. We know the Architects well, in fact this firm was a sponsor of the SCHOMS Learning Space Design Workshop held at the University of Birmingham in 2010, so we are confident that our input will be recognised and appreciated. My interest in Yonsei University Library came about as a by product of recent meetings between Samsung UK and the University of Birmingham about developments in technology that we might wish to deploy in a new University Library. We discovered that Samsung SDS (Korea) actually built the Yonsei Samsung Library which opened 4 years ago and were instrumental in helping the Librarians at Yonsei achieve their vision of creating a high tech 21st Century University to meet the needs of the University and its students. so, with a trip already organised to visit our U21 Partners in Korea University, it was seen as opportune for me to have a look at Yonsei, and I wasn't disappointed! 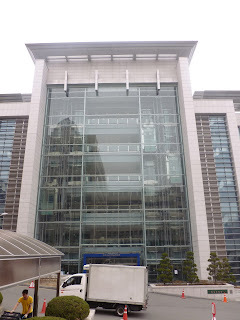 The Yonsei Samsung Library is actually an extension to the original Central Library rather than a replacement. The main bulk of the book collection remains in the Central Library space, although the Law library has been located within the new facility. 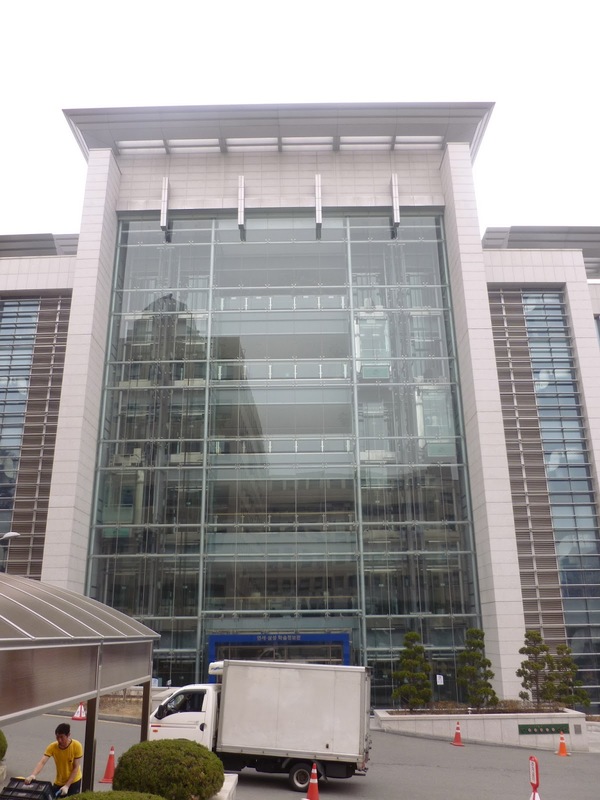 For clarification, together the Libraries are known as Yonsei University Library (YUL), but the extension is known as the Yonsei Samsung Library as a result of generous donations to the project by a division of Samsung. The moment you walk through the main entrance to the building, you can see that you are entering something quite different. Through the barriers where students have to both check into the library and check out (more about that later) you enter the "U-Lounge"
This space is located on the basement floor of the Yonsei Samsung Library and is connected through a wide and spacious corridor to the first floor of the Central Library. The space has been discretely divided to serve a number of functions. There is space to relax on comfy seating, space for group work and access to a wide range of digital facilities and a cultural hub which includes gallery and exhibition space, it is also used for concerts. It is called the U-Lounge because it utilises ubiquitous technologies throughout. One area of the U-Lounge is set up with MOD stations, Media on Demand including movies, video clips, images and IPTV. There is a PC located in the totem and the desk has an input plate for power, data and control of the screen and PC. 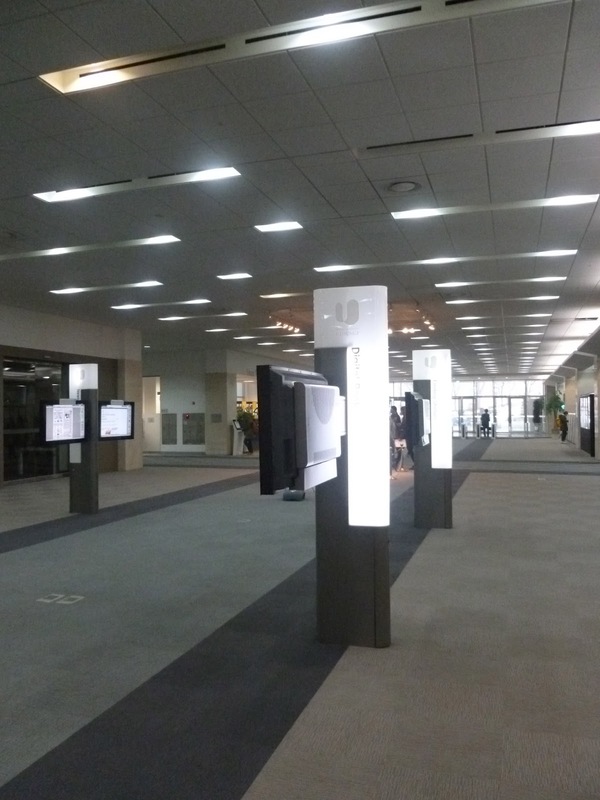 Down the centre of the U-Lounge are a number of totems with twin touch sensitive screens. On one side of the "corridor" the screens give access to over 1100 newspapers and magazines from over 80 countries. These are updated daily. The other screens enable users to read e-book contents in a number of categories including best sellers and new books. A feature of the facility is the Global PC Island, a group of PC's set up with appropriate software and keyboards for a range of languages, Chinese, Japanese, French, Russian etc. This is just a small area of the 7 storey building, there is still lots to talk about, but that's for next time, I'm off for dinner!! Wow. Now to get the Panasonic library in Aber. 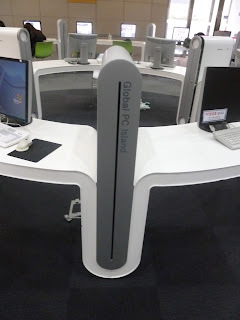 Is the pic above the Japanese setup of the computer, it says global PC Island on it? There seems to be lots of space around everything, something I find hard to get people to accept. Often colleagues see an unocupied space as a waste of space when in fact it allows freedom of movement and provides a much less stressfull environment. Media on Demand and Ubiquitous are their terms. Although away from the University campuses I have found difficulty in finding english speakers, (so most of my day to day activity has been quite interesting!!) many of the courses delivered at University are in english and the students are expected to have a good level of english when they arrive. Yes, the picture is just showing a leg of the island which has a number of PCs with different languages around it. As for the space, both Korea University and Yonsei have created facilities that can accommodate huge numbers but not feel cramped or crowded, as I will show in my next posting. This is pretty impressive. I love the use of space and lights; but how is the noise managed? They don't worry about noise in the U-Lounge, but to be honest it was pretty full and quite quiet. And all other places were very quiet. It was very noticeable just how quiet these areas full of students were. Most of them were working as individuals, and most of the study spaces had screens to create discrete spaces, so I guess the opportunity to be noisy is limited to the communal areas and study pods.